Want to live on Mars with 1M of your closest friends? 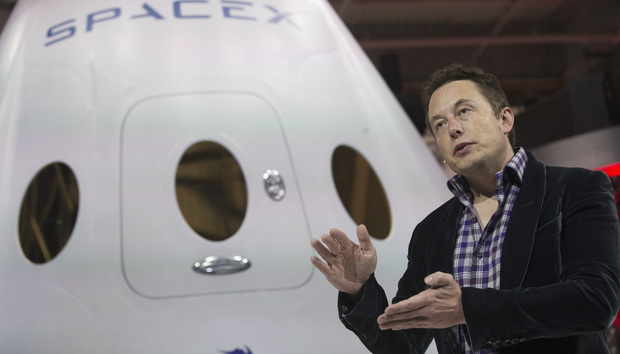 You might think Elon Musk, the CEO of SpaceX, might dream of putting an astronaut on Mars. But the high tech entrepreneur envisions the day when there is a working, thriving, self-sustaining civilization of a million people or more on Mars. Musk has faith his dream will turn into reality, maybe in 100 years or less. He's already started figuring out and building the technology that would be needed to transport hundreds of people and the equipment required to build habitats, greenhouses, iron foundries and propellant plants on the Red Planet. "Why go anywhere?" Musk asked during a speech Tuesday at the International Astronautical Congress in Guadalajara, Mexico. "There really are two fundamental paths. One path is we stay on Earth forever, and there will be an eventual extinction event. The alternative is to become a multi-planet species. I hope you would agree that is the right way to go." Pointing to a massive image of Mars, he added, "That's what we want." Musk is no stranger to big ideas. Aside from helping to create online payments company PayPal, he also founded Tesla Motors, the electric car company. Musk is also the founder and CEO of SpaceX, the first commercial company hired by NASA to ferry cargo to the International Space Station. "As we show that this is possible, that this dream is real and not just a dream but something we can make real, I think support for it will snowball over time," he said in his speech, which was webcast. "We're trying to make it such that anyone can go. ... Life needs to be more than just solving problems every day. You need to wake up and be inspired by the future and wake up and want to live." Musk said he wants to build a system where nearly anyone could go to Mars, but it must be understood that it will be a dangerous journey. "I think the first journeys to Mars are really going to be really very dangerous," he said. "The risk of fatality would be very high. There's no way around it. So I would not suggest sending children. It would be, basically, are you prepared to die? OK, then you're a candidate for going." He added that he's not concerned about who gets to Mars first and might only recommend a few days of training before anyone departs. "The thing that really matters is making a self-sustaining civilization on Mars as fast as possible," Musk said. "This is not about everyone moving to Mars. It's about being multi-planetary. The life span of human civilization will be much greater if we're a multi-planet species." Musk wants to send two cargo ships to Mars by 2020, carrying payloads of equipment and supplies. "We want to establish a steady cadence that there's always a flight leaving, like a train leaving the station," he said. "With every Mars rendezvous, we will be sending a Dragon [the SpaceX cargo craft] to Mars, so if people are interested in putting payloads on Dragon, they can count on a ship delivering a transport of two or three tons of useful payload to the surface of Mars." Then there will have to be a spaceship. Musk envisions a spaceship that initially can carry 100 people, along with their belongings and the equipment and supplies needed to build propellant factories, foundries, greenhouses and housing. The spaceship would be about 162 feet long, about half the size of a football field. It would be about 56 feet in diameter and would carry 450 tons of cargo on its long journey to the Red Planet. Don't worry about the travelers getting bored or feeling cooped up during the trip. Musk said they'll have entertainment in the crew compartment, zero gravity games, movies, cabins and a restaurant. "It'll be like really fun to go. You'll have a great time," he added. Musk calculated that a million people would be needed to create a self-sustaining colony on Mars. To get them there, with 100 people traveling aboard one spaceship and spaceships only able to travel between the two planets every two years, he'll have to send a fleet of spaceships at one time. "Like on Battlestar Galactica, if you've seen that," said Musk. "That's a good show." According to Musk, it would take 20 to 50 trip of the Mars fleet to get a million men and women on the planet. And that could take 40 to 100 years from the time the first spaceships begin ferrying settlers to Mars. How much would it cost to move to Mars? Well, if it was even possible today, Musk estimates it would cost about $10 billion per person. A little steep. However, he said he hopes to get that cost figure down to $200,000 per person by the time the project is in full swing, and eventually down to $100,000 per ticket. There are several technological necessities that need to be developed before another planet can be colonized. The spacecraft, which will use solar arrays to boost its power, will need to be fully reusable so Mars doesn't become littered with expensive and useless space vehicles. Those spacecraft also will have to be refilled in orbit and methane-based propellant will need to be made on Mars so the spacecraft won't have to carry the fuel with them, which would be unwieldy and expensive. "We're going to try to make as much progress as we can on the elements of the interplanetary transport booster and spaceship," Musk said. "Hopefully we'll be able to complete the first spaceship in maybe about four years and start doing suborbital flights with that. Should have enough capability to even go to orbit. We can't get back but we could get to orbit." He added that developing a new rocket booster should be relatively straightforward since SpaceX engineers can scale up their Falcon 9 booster. "We don't see a lot of show stoppers there," Musk said. He also noted that Mars settlers would be able to use water ice on the planet, could use solar panels to generate energy and should be able to grow their own food.